Major and Mrs Holt barely need any introduction. Battlefield guide veterans, their guide books have been reprinted several times over. 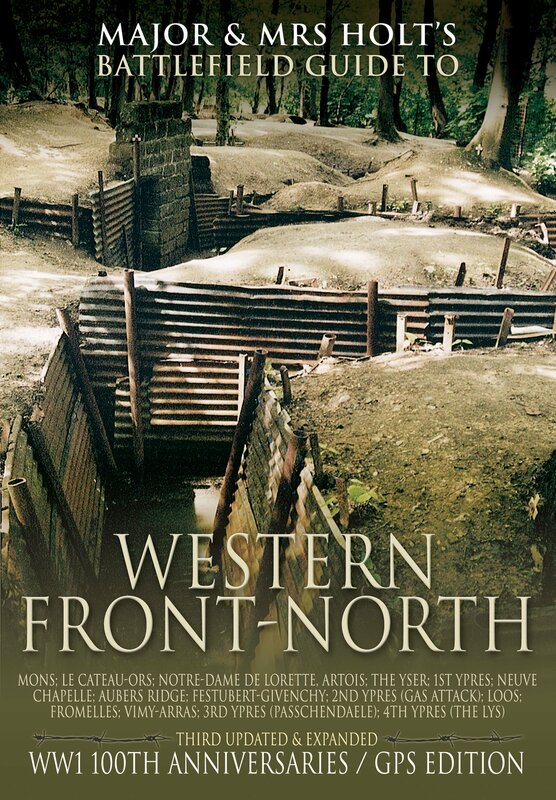 This is the third edition of ‘Western Front – North’, updated with GPS co-ordinates and latest visitor information. A brief addendum highlights recent developments such as the opening of the Plugstreet 14-18 experience, and new memorials including the striking Black Watch soldier at Black Watch Corner. Rather than cover each area as a whole, the tours in the guide are set out to follow the different battles and campaigns, covering Mons, Le Cateau-Ors, Notre-Dame de Lorette, Artois, the Yser, 1st Ypres, Neuve Chapelle, Aubers Ridge, Festubert,-Givenchy, 2nd Ypres, Loos, Fromelles, Vimy-Arras, 3rd Ypres, and 4th Ypres (the Lys). Unsurprisingly Ypres and it surrounds features heavily in the book; those travellers just visiting that part of the battlefields may benefit from using the standalone Ypres guide instead. That said, if you fancy venturing down to Messines, Wytschaete, Ploegsteert or further, then this guide will ensure you can cover many of the key points of interest. Visitors to the battlefields are now spoilt for choice for guidebooks to choose from. Whilst there are many comprehensive books out there, Major and Mrs Holt’s offering sets the bar in terms of quality and depth of information. The production quality is superb, lavishly illustrated with high quality photos and maps. Tours are clearly set out, introduced by brief summaries of the action that occurred. If anything, there is almost too much information, and the first time visitor may well be overwhelmed by the sheer amount of memorials, cemeteries, and points of interest that are covered. That said, the guide will ensure that the visitor is armed with all the information they need for a trip to the battlefields, and is definitely one I will be taking with me on my next trip.